An article about Mary Rodes, a young opera singer from Wicheta, Kansas who performed at the Georgia State Fair in 1936. She is 21 and described as modest and shy. She talks about how radio has helped the spread of opera and her favorite performances as a singer. 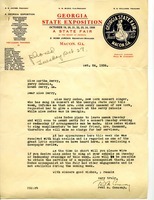 Conaway writes to make arrangements for a concert at Berry by soprano Mary Rodes. Rodes is performing at the Georgia State Fair and her friend Emily Vanderbilt Hammond has suggested the concert at Berry. The article describes the lavish success of this year's Grandstand performance, a 70 persons revue. It describes several of the performances, including opera singer Mary Rodes (this passage is marked), dance numbers, and acrobatics. The article also comments on Miss Rodes' background (again marked) and provides information for the remaining performances.